Gold was first discovered as shining, yellow nuggets. “Gold is where you find it,” so the saying goes, and gold was first discovered in its natural state, in streams all over the world. No doubt it was the first metal known to early hominids. Gold was the first metal widely known to our species. When thinking about the historical progress of technology, we consider the development of iron and copper-working as the greatest contributions to our species’ economic and cultural progress – but gold came first. Gold is the easiest of the metals to work. It occurs in a virtually pure and workable state, whereas most other metals tend to be found in ore-bodies that pose some difficulty in smelting. Gold’s early uses were no doubt ornamental, and its brilliance and permanence (it neither corrodes nor tarnishes) linked it to deities and royalty in early civilizations . Gold, beauty, and power have always gone together. Gold in ancient times was made into shrines and idols (“the Golden Calf”), plates, cups, vases and vessels of all kinds, and of course, jewelry for personal adornment. The “Gold of Troy” treasure hoard excavated in Turkey and dating to the era 2450 -2600 B.C., show the range of gold-work from delicate jewellery to a gold gravy boat weighing a full troy pound. This was a time when gold was highly valued, but had not yet become money itself. Rather, it was owned by the powerful and well-connected, or made into objects of worship, or used to decorate sacred locations. In the quest for gold by the Phoenicians, Egyptians, Indians, Hittites, Chinese, and others, prisoners of war were sent to work the mines, as were slaves and criminals. And this happened during a time when gold had no value as ‘money,’ but was just considered a desirable commodity in and of itself. The ‘value’ of gold was accepted all over the world. 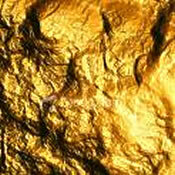 Today, as in ancient times, the intrinsic appeal of gold itself has that universal appeal to humans. But how did gold come to be a commodity, a measurable unit of value? Gold, measured out, became money. Gold’s beauty, scarcity, unique density (no other metal outside the platinum group is as heavy), and the ease by which it could be melted, formed, and measured made it a natural trading medium. Gold gave rise to the concept of money itself: portable, private, and permanent. Gold (and silver) in standardized coins came to replace barter arrangements, and made trade in the Classic period much easier. Gold was money in ancient Greece. The Greeks mined for gold throughout the Mediterranean and Middle East regions by 550 B.C., and both Plato and Aristotle wrote about gold and had theories about its origins. Gold was associated with water (logical, since most of it was found in streams), and it was supposed that gold was a particularly dense combination of water and sunlight. Their science may have been primitive, but the Greeks learned much about the practicalities of gold mining. By the time of the death of Alexander of Macedon (323 B.C. ), the Greeks had mined gold from the Pillars of Hercules (Gibraltar) all the way eastward to Asia Minor and Egypt, and we find traces of their placer mines today. Some of the mines were owned by the state, some were worked privately with a royalty paid to the state. Also, nomads such as the Scythians and Cimmerians worked placer mines all over the region. The surviving Greek gold coinage and Scythian jewelry both show superb artistry. The Roman Empire furthered the quest for gold. The Romans mined gold extensively throughout their empire, and advanced the science of gold-mining considerably. They diverted streams of water to mine hydraulically, and built sluices and the first ‘long toms.’ They mined underground, also, and introduced water-wheels and the ‘roasting’ of gold-bearing ores to separate the gold from rock. They were able to more efficiently exploit old mine-sites, and of course their chief laborers were prisoners of war, slaves, and convicts. A monetary standard made the world economy possible. The concept of money, (i.e., gold and silver in standard weight and fineness coins) allowed the World’s economies to expand and prosper. During the Classic period of Greek and Roman rule in the western world, gold and silver both flowed to India for spices, and to China for silk. At the height of the Empire (A.D. 98-160), Roman gold and silver coins reigned from Britain to North Africa and Egypt. As far back as 3100 B.C., we have evidence of a gold/silver value ratio in the code of Menes, the founder of the first Egyptian dynasty. In this code it is stated that “one part of gold is equal to two and one half parts of silver in value.” This is our earliest of a value relationship between gold and silver. In ancient Egypt, around the time of Seti I (1320 B.C. ), we find the creation of the first gold treasure map now known to us. Today, in the Turin Museum is a papyrus and fragments known as the “Carte des mines d’or.” It pictures gold mines, miners’ quarters, road leading to the mines and gold-bearing mountains, and so on. Where is that gold mine located? Well, you know how it is with treasure maps – there’s always something a little vague about them, to throw you off the trail. Modern thought is that it portrays the Wadi Fawakhir region in which the El Sid gold mine is located, but the matter is far from settled. Jason and the Argonauts sought the Golden Fleece around 1200 B.C. That Greek myth makes more sense when you realize that the fleece that it refers to is the sheep’s fleece used in the recovery of fine placer gold. Early miners would use water power to propel gold-bearing sand over the hide of a sheep, which would trap the tiny, but heavy, flakes of gold. When the fleece had absorbed all it could hold, this ‘golden fleece’ was hung up to dry, and when dry would be beaten gently so that the gold would fall off and be recovered. This primitive form of hydraulic mining began thousands of years ago, and was still being used by some miners as recently as the California gold rush of 1849.